The Chicago Cubs 16-4 blowout victory over the Arizona Diamondbacks was a full team effort, as every Cubs batter contributed at least one hit to the team’s victory. But of all of the 17 hits collected by Cubs hitters during the game, perhaps the most surprising was a third inning home run hit by Cubs starting pitcher Jon Lester, the first of his career. Lester became notable for his hitting during the 2015 season -- because of his futility rather than his success. Lester started his career 0-for-66 at the plate, a major league record for hitless at-bats to start a career. But he appeared to have put that ignominious past behind him, adding a second inning single to finish the day 2-for-2 and raise his season batting average to .150. 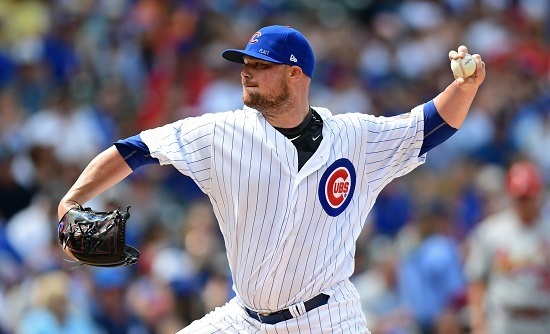 Lester also added an accomplishment on the mound, striking out pinch hitter Jack Reinheimer for the 2,000th strikeout of his career. Lester became only the 25th left-handed pitcher in Major League Baseball history to reach that mark. Ian Happ, Javier Baez and Anthony Rizzo (twice) also homered for the Cubs. Every Cubs hitter collected at least one run or RBI. Mike Montgomery threw the final three innings in relief for the Cubs, collecting his third save of three or more innings this season. Reserve infielder Daniel Descalso made just the second pitching appearance of his career for the Diamondbacks, sitting down all three Cubs hitters he faced in the eighth inning. With their win, the Cubs maintained their 2 1/2-game lead over the Milwaukee Brewers in the National League Central. The game was the first of a three-game series against the Diamondbacks that concludes Thursday.